Did someone say sponging????? Woo hoo! I LOVE sponging on my cards!!! I was inspired by Julie's use of color and the Bloom Sketches stamp set in this card here - posted in honor of Stamplorations 5th birthday celebration, but I decided to use sponging for a bg rather than watercolor. I masked one side of my card front, stamped the flowers, then colored with copics. Then I cut masks for the flowers, masked them, and sponged my bg with Distress Oxide inks. I splattered very carefully with water, blotted, and then splattered with white paint and with shimmer spritz. Carefully removed the masks, drew a black line along the border, embossed the sentiment panel, attached with dimensionals, and added sequins - so fun!! Almost a one-layer-card! For sure, Maura, I can tell you love sponging. And, the water drops look fabulous. Adding the water and white paint sent it over the top. Good job with the black border line. Beautiful card! Beautiful blue to yellow sponged background for your cheerful daisies. I'm quite impressed with your carefully placed water and paint splatters! Gorgeous!! and yes we can see you love sponging and you're so good at it!! Maura, you are the master when it comes to making a beautiful card with sponging! Your card is gorgeous! The sponging between the daisies is wonderful! 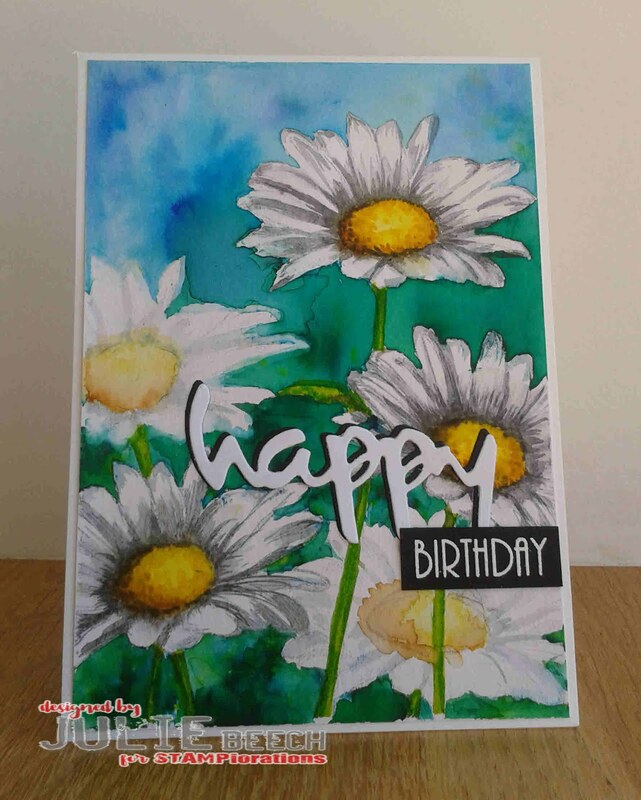 Maura, your daisies are beautifully shaded and that sponged bg is marvelous! Love the CAS feel with the white strip. Really pretty blend of colors. Beautifully masked and color sponged around the daisies. The spattering of water and white paint is a wonderful effect. Gorgeous card! You are sponging royalty, mf - as usual, your card does not disappoint. Love the look of the white flowers with all the surrounding color.